On last June 2nd took place the closing day of the II FORUM INDUSTRIA 4.0; organized by the commission “Industry 4.0” of the joint Engineers College of Catalonia. 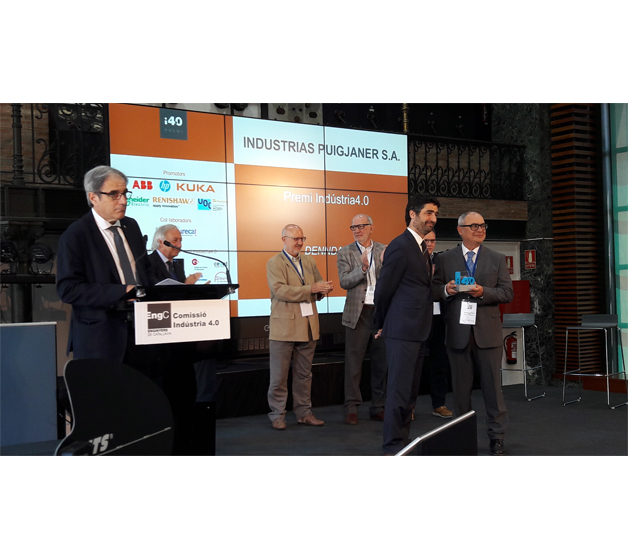 Among its Agenda, the ruling on the winner of the first issue of the “Industria4.0” Prize; to acknowledge the companies that are endeavouring in innovative projects into the Industry 4.0 frame, in Catalonia. In this first issue, 4 companies were selected as finalists, to show to the interested audience their proposals in this field: new technologies that can lead to new business models. Finalists were ENGIDI, an start-up that develops apps for the personal safety in the industry, INDUSTRIAS PUIGJANER – DENN, presenting its challenging project DENN DATA; SALICRU, with its project ODISSEY to digitize its whole range of SAI devices; and SEAT; showing its project in education 4.0 for the automotive industry. From DENN's side – leader in Machinery for metal deformation by rotary means -, it was Blanca Puigjaner, Director of Projects, who presented the DENN DATA, a project made in cooperation with TECNALIA, Research Centre in the Basque Country. This system collects, and stores in the cloud, all data remotely gathered from the last generation of machinery – heavily equipped with sensors -, made by DENN. The goal is to get a complete analysis of the machines, to optimize energy consumption, absolute and per part fabricated, improve working cycle times to boost productivity and customer profit margins. Same in this direction, the analysis makes much easier a policy of predictive and preventive maintenance, preventing non programmed stops and increasing even more the OEE of DENN machines. Once made all 4 presentations, the jury made public the ruling of the prize, which was awarded to INDUSTRIAS PUIGJANER – DENN project, and delivered to DENN’s CEO, Mr. Joan F. Puigjaner, by Mr. Jordi Puigneró, Secretary of Telecommunications, Cybersecurity and Digital Society of Catalan Government.